The three carborundum prints, “Land, Sea and Sky” hanging in my studio are now dry and are an inspiration for me to return to the same plate and explore further colour-ways. It’s interesting how when I first printed them I favoured the prints with the red band but now I’m going to experiment further with transparent and opaque blue hues. The sea across Lyme Bay yesterday was silver and merged into the distant haze around the South Devon and Dorset coast. White horses shone in the early morning sun. The sea in Torbay was extremely lively. The waves at high tide dashed over the seafront with great force, and the whiter than white spray glistening in the sun looked quite joyous and shouted with a freshness that it’s great to be alive. This feeling of exhilaration and lifting of the spirit is something that I’m endeavouring to capture. Today the high tide had a grey fury and threw its treasures over the seawall at tourists and cars alike. Rolling the relief ink on the glass slab. The plate has already been inked with the intaglio blues. Photograph by Julia Finzel. 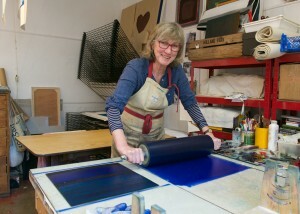 The photographer and printmaker, Julia Finzel, spent an afternoon in my studio taking photos of me working. She is undertaking an interesting photographic project about artist printmakers who have worked at Dartington. 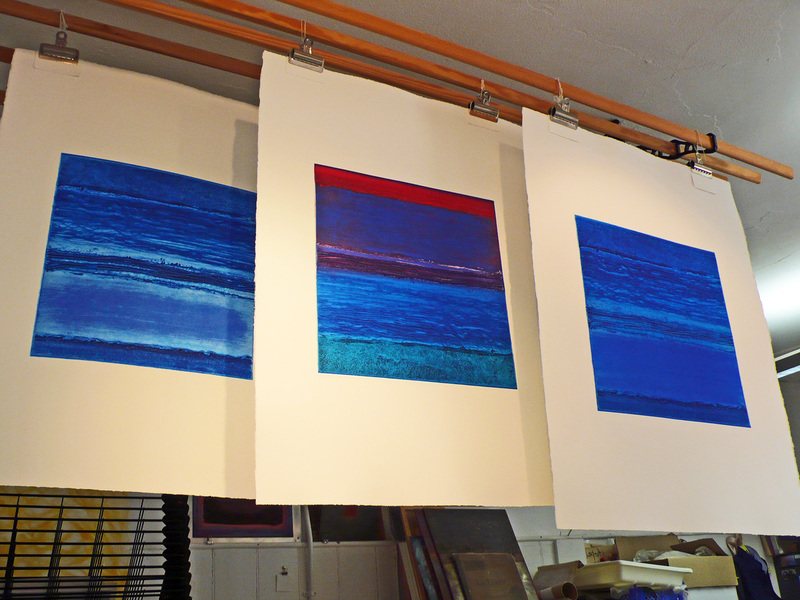 The colours I am mixing will have a higher chroma than the blues of today’s sea: for the intaglio colours – I have added viridian to azur, ocean or orient blue and violet with Prussian blue, and for the rolled blues extender with thalo, royal and ultramarine blue. Lots of inks were used and extender tubes now empty! I must now order some more tubes of intaglio extender and relief extender.